If you like to go to the theatre so that you can take plays home in your head; if you want to go in search of images that will move you, even if you do not immediately ‘understand’ them, and if you are a seeker of restlessness, then Ramu Ramanathan’s COMRADE KUMBHKARNA presented by the National School of Drama (NSD) repertory company is a must see. From the dark recesses of the stage comes forth a troupe of performers to create and inhabit an imaginary world that is at once ancient yet contemporary, impoverished yet dreamy, profane and vulgar, and yet at the same time immensely poetic and beautiful. Before your eyes the story unravels myths, age old lores that we take as given, staid authority, and its banal memorandums. In a very Marquezesque fashion, the divide between the god and the demon, the Aryan and the Dravidian, the good and the cruel is analyzed and cut to size. Instead we are given a new lore, a new protagonist- a hero in chains instead of the arch archer. An actor who becomes the character he plays; a hero who is part folk performer, part Kumbhakaran…A Kumbhakaran who is part demon, part god. By mussing up the divide between the real and the unreal, between the personal and the political, between the historical and the contemporary, we are taken on a wild journey. It’s also a precarious one as most journeys that take you away from the known are. It’s also a bold play for its current political resonances. There is intensity to it due to the eloquent hyper real imagery that director Mohit Takalkar and his team have evolved to tell the story. Though the original text by Ramu Ramanathan is in English, the Hindi version by Santwana Nigam is equally remarkable for the nuances it generates while fitting the original to a Hindi speaking, Hindi singing, and Hindi dancing culture of the play’s world. Music by theater veteran Kajal Ghosh is alluring as it takes off from the age old rhythms of the folk and becomes one of the most accessible and entertaining elements of the production. A special mention needs to be made about the light design by Pradeep Vaiddya. While working at a repertory, that too of a national stature, one often tends to be compelled to make a statement with the kind of facilities available and to dazzle the audience with the power of technology. Pradeep successfully shirks these temptations. The lighting is novel. It is extremely economical and yet very interesting and effective. So was the initial idea for the costumes of the play, but the execution lacks conviction. It would have been interesting to see more grime, dirt, real wear and tear, and crumpling of the costumes and the effect it would have on the overall narrative, akin to the effect that the crumpled tape spools or the red trunk and the mirrors have. While casting actors without knowledge of fluent English, the director needs to explore other devices that would fit well with the varying power structures that the characters represent. Actors playing the characters of Tripathi and Singh are otherwise quite capable actors but come out as limited in their rendering because of their self consciousness in speaking the English text. The younger Kumbhakaran played by Ajit Singh Pahlavat brings a lot of energy and vulnerability to the role. Though the older Kumbhakaran succeeds at the poetic moments in the play, the angst that can spark revolutions, the simmering and smoldering of the protagonist, is missing from the body language, and makes for a lukewarm portrayal of the central role. The twin sister played by Rakhi Kumari is memorable and some of the images she creates are stunning. A special mention is required for the role of Amma played by Sajida. Her stage presence, the texture of her voice all lend favorably to the portrayal. The irreverence and the grit of Amma’s character is played out with a studied amount of detailing by Sajida and it’s a pleasure to watch her throughout the play. Madame X, although a small role, is played by Ipshita Chakraborty with a commendable poise. 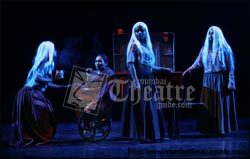 Some questions that I took back with me that may or may not be in direct relation to the play-but concern the broader context of theatre and Indian theatre in general —would the real “Kumbhakarans” (who are mentioned at the end of the play’s brochure and who Ramu dedicates the play to….) be really silent on the key issues that get picked up in the play but are met with silence by the stage Kumbhakaran? In current political scenarios of the Indian subcontinent what is and should be the role of theatre— can it be ok for us to just be mirrors and reflect back the complex painful reality? If one is taking pangas with the powers that be…why take a non committal panga? Why make Kumbhakaran silent on key issues? Is it only possible in the Indian context for a playwright to be writing about Gandhian thought and Maoist thought one after the other, and what are the implications of such writing- if any? Will the repertory take such a play to the real places out of which the characters in the script have developed? If at all any such interaction is generated what shape would the play take then? Thankfully the life of repertory productions is far greater than most other productions that get mounted elsewhere in the country. And a lot can be done with such a play. It will be quite interesting to watch the journeys that it embarks on, and the effect it produces. *Sonalee Hardikar is a graduate of the National School of Drama and also the recipient of the Jim Henson fellowship under which she studied scenic design at the University of Maryland. She is a visiting faculty at the National School of Drama and runs a photo studio in Albany, New York. This review seems to be “inspired” heavily by the Frontline Magazine ‘s review of the same play. So many points have been copied as if the writer had no original experience of her own.